We look forward to seeing you soon. See below for helpful tools to plan getting here by auto, rail, bus, or air. You can also review the number of services available to help you get around the area once you arrive. 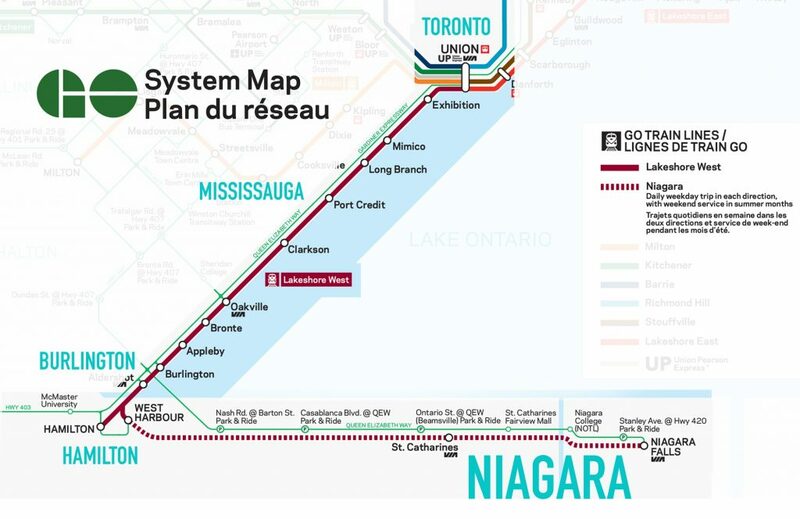 Daily round trip Go Train routes from Toronto to Niagara. Also, in addition to its year-round Go Train and Go Bus service to Niagara, GO Transit offers weekend trains between Toronto and Niagara Falls during the summer starting Victoria Day weekend. GO Transit also offers shuttle bus service between the St. Catharines GO Train stop and downtown Niagara-on-the-Lake making getting around Niagara very easy and convenient. Travellers can also reach Niagara from Canada and the U.S. by rail with VIA Rail and Amtrak service stopping in Niagara Falls and/or St. Catharines. Niagara has a well-developed network of highways that allow seamless travel into and throughout the region. No car? No problem. Year-round bus service to Niagara is available through GO Transit, Coach Canada and Greyhound. Niagara is accessible by air through four international airports, Buffalo Niagara, Toronto Pearson, John C. Munro Hamilton, and Niagara Falls U.S.A. all offer daily shuttle service throughout the Niagara region. Travellers coming via land from the United States have four international bridge crossings in Niagara to choose between: Rainbow Bridge, Lewiston/Queenston Bridge, Peace Bridge and Whirlpool Bridge (Nexus). For an up-to-date listing of border wait times, visit the Niagara Falls Bridge Commission website. You may also wish to review these links to ensure you’re prepared for crossing the border. The EDTC (Economic Development & Tourism Corporation) is an information centre servicing visitors for Niagara’s South Coast located in Fort Erie. For more information, visit the EDTC website. A vibrant and impressive city located on the south shore of the scenic Niagara Region, Port Colborne is a community embedded in marine heritage and welcoming hospitality. With a generous climate, ample beachfront, and cultural attractions, Port Colborne is truly a destination you must visit! For more information, visit the City of Port Colborne website.